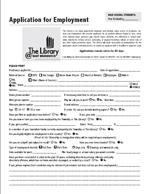 Click on the image above for The Library's employment application that you can fill out on your computer. The application is an Adobe Reader (PDF) file and Adobe Reader is required to view and print it. You can download Adobe Reader here. Adobe Reader is free.